Yamaha’s YSP-1400 Sound Projector delivers a bevy of features, an immersive soundstage, and great detail. 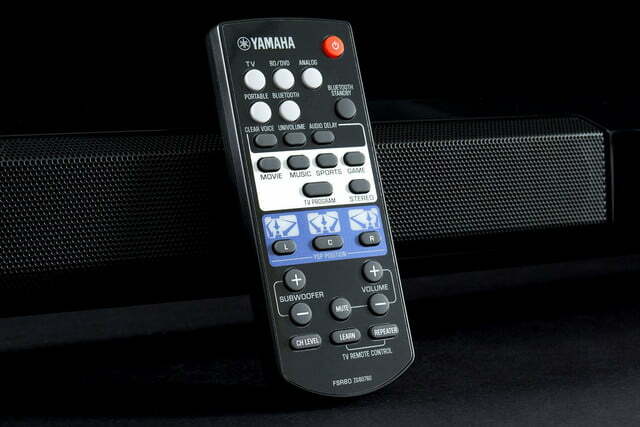 Yamaha’s new YSP-1400 Digital Sound Projector ($400) may look like your run-of-the-mill sound bar at first glance, but as its title implies, the “sound projector” does things a little differently. Unlike many sound bars, which use sets of speakers placed at the edges, Yamaha’s projector employs an array of eight small drivers placed smack in the middle. The array is is designed to beam sound out into the room and bounce it off the walls, creating the illusion of a fully immersive 5.1 surround experience. To supplement its array, the 1400 boasts two down-firing subwoofers, and supports it all with plenty of DSP, providing plenty of sound customization. They say size isn’t everything, but we still wondered if the projector’s little drivers would work in tandem with the similarly small subs well enough to generate a balanced, engaging performance worthy of gracing your TV stand. The 1400 emerged from its box in a refreshingly simple configuration. The sound projector is an attractive, autonomous bar, with a robust screen guarding the dappled drivers at the center, and sharp angled lines cut across the front face. 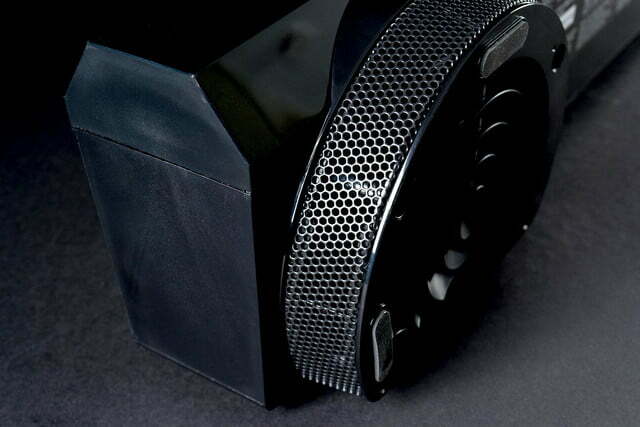 The subwoofers extending from the bottom edges look vaguely reminiscent of a jet’s afterburners. 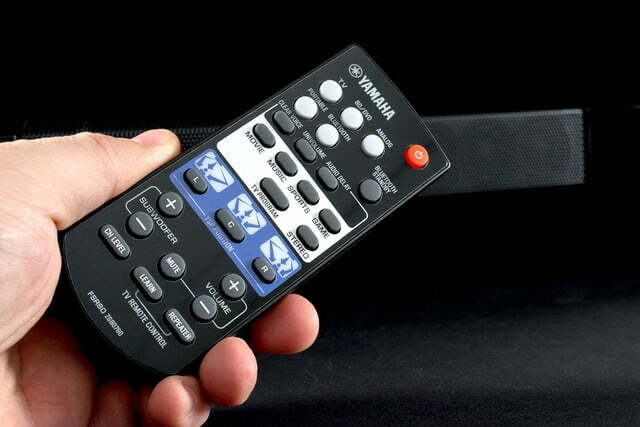 Like most of Yamaha’s sound bars, the unit provides only a collection of LEDs cast to the left side of the front face as a digital display, while the right side sports control buttons for power, volume, and input selection. Inside the box we found a remote control, a digital optical cable, and some instructions. The YSP-1400’s gleaming plastic shell manages to present a relatively elegant aesthetic without looking cheap or gaudy. The lack of a separate subwoofer cabinet allows for a succinct occupation of your entertainment center, though the bar’s 5-inch depth does take up a bit more space on the shelf than some other units in its class. The lack of a separate subwoofer cabinet allows for a succinct occupation of your entertainment center. At the 1400’s back side is a decent collection of input ports, including RCA and 3.5mm analog inputs, coaxial and optical digital inputs, and an output port to allow for a separate powered subwoofer should one be desired. 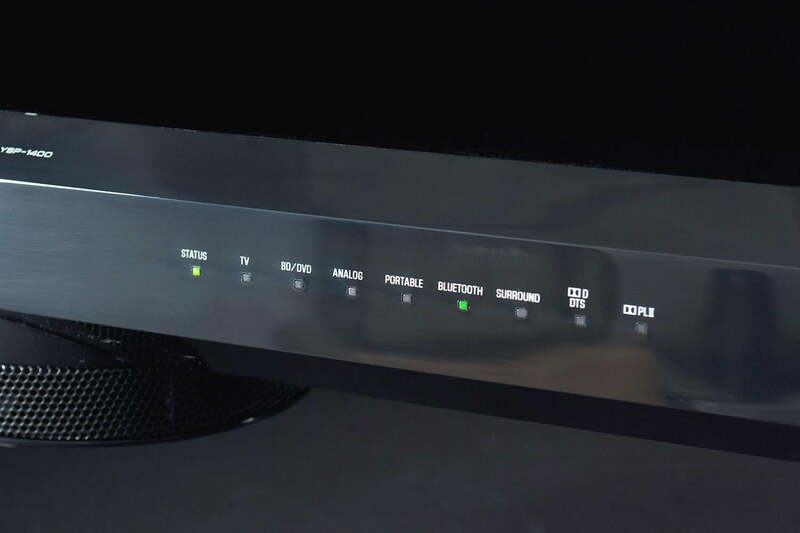 The system’s lack of an audio return channel (ARC) HDMI connection means most people will need to add another remote control to the coffee table, though the system does allow programmable control of volume, mute, and power commands from your TV remote. We’ll discuss that more in the section below. 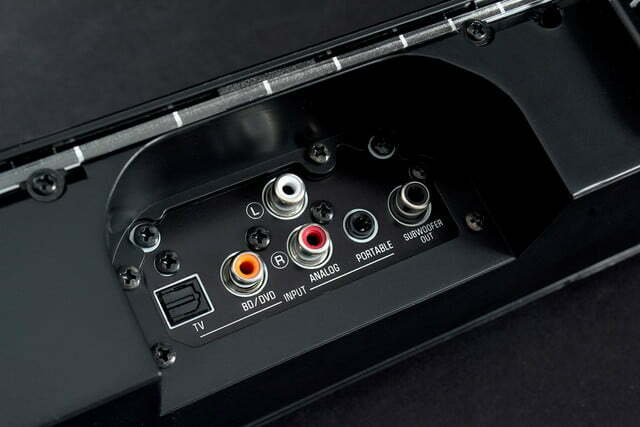 The sound projector’s other features include an IR repeater, in case the unit blocks the receiver on your TV, DTS and Dolby digital decoding, virtual 5.1 channel configuration and surround sound, and Bluetooth connection for wireless music streaming as well as access to Yamaha’s free controller app for mobile devices. While the app provides a streamlined interface to access the system’s commands, virtually all available features can also be easily accessed by the provided remote control. The remote allows the user impressive reign over the system’s extensive digital processing. 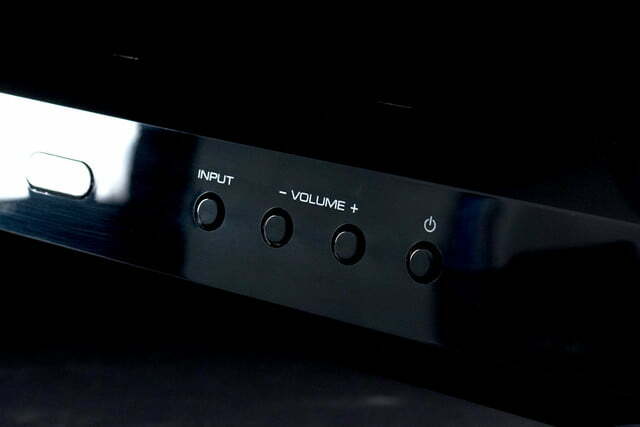 There are the usual keys for basic functions such as source selection, volume and subwoofer levels, and to control Yamaha’s template virtual surround sound effects such as Movie, Music, and Sports. But the remote also run deeper, allowing you to easily change the surround configuration depending on your sitting position from center, right, or left, as well as to change the levels of each individual channel, something we’ve rarely seen in a unit at this price. 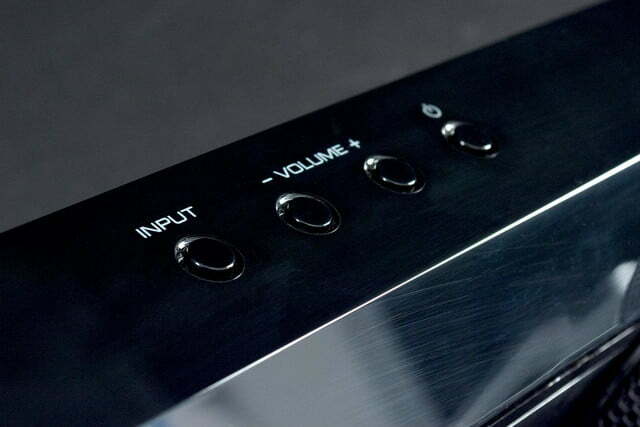 You can also change the amount of dynamic compression so you don’t blow the doors off the joint when the system switches from quiet to loud moments. With the 1400 in particular, we were thankful for the inclusion. The defaulted “Normal” compression setting still allowed for too much volume range between lighter moments and action scenes, so we set the unit to “Standard” which helped calm the transition, while still allowing decent dynamic range in the softer moments. There is also a “Maximum” setting, which removes all normalization completely, but we wouldn’t recommend trying it unless you want to make your ears bleed during action scenes. The system manages to deliver a serious level of velocity from its relatively reserved amplifier, which offers a conservatively-rated 76 watts of total power. 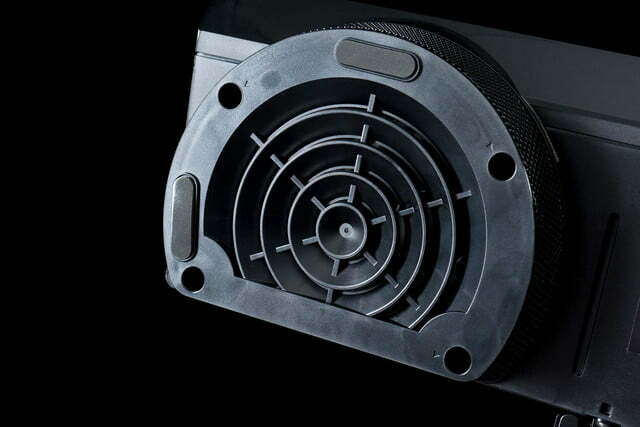 The division is broken down into 30 watts of boom for each 3¼-inch sub, and a tiny burst of 2 watts for each of the eight 1⅛-inch “beam” drivers. We connected our unit via the provided optical cable from the optical output of our TV. With no ARC connection available, we recommend this method as the simplest way to immediately get things rolling, though most users will also want to take the time to program the projector to respond to basic commands from their TV remote. Doing so requires pressing the Learn key on the provided remote for three seconds, and then individually holding down the power, volume, and mute keys on your TV remote from 12-inches in front of the unit for “more than a second,” two to three times. It’s a somewhat arduous process, but we were eventually able to get the system to read our Samsung remote’s power key, allowing for a one-step power-up of both units. However, while it may have been a simple malfunction, the 1400 failed to communicate with the remote’s volume and mute keys on 3 separate programming attempts. We started our evaluation by auditioning some high-powered action flicks from our Blu-ray collection, including the sci-fi classic, Terminator, as well as Nolan’s, The Dark Knight Rises. Right away, the system showed an aptitude for detail, especially in the dialog, providing a clear and tight center image that performed far beyond what we’d hear from the wimpy speakers of a standard flat screen. Occasionally dialog and effects sounded a little flat, which seemed to happen in more complex aural environments, but overall we enjoyed keen precision and clear-cut attacks. Not surprisingly, the unit’s virtual surround sound wasn’t quite as immersive as advertised, so fly-bys from aerial vehicles were less traceable from side to side than many systems we’ve tested. It should be noted that, in order to get the most convincing surround effect, the projector needs walls at right angles to its position so that sound is reflected properly. But, as will be the case for many users, that arrangement simply wasn’t possible in our home test environment. We did test the unit in a perfectly suitable environment, which gave the virtual surround performance a boost, but not a huge one. With all of that said, the system did showcase excellent dimension in the soundstage, evidenced straight away by the entrance of the robotic ship in the Terminator intro. As the ship flew overhead, our ears were tricked into a distinct impression of central positioning just above us, and we were able to follow it as it seemed to submerge deeper into the back layers of the battlefield. While that was the most visceral moment, other effects continued to create a general impression of depth and layering that was impressive. The projector also impressed with its prowess for highly charged response in the bass, bellowing rigid echoes from the subs which vibrated through the floor during heavy explosions and fire fights, even knocking a CD off of our TV stand. Bass was tight, and more than powerful enough for most content at the lightest subwoofer setting. At higher volumes, the subs lost some definition, but we never felt the need to push the system that hard in typical listening scenarios. We did wish, however, that the subs could climb a little higher into the lower midrange. The small drivers, while expressive and precise, tended to get pretty icy at the center of the sound, and effects like gunshots, car doors clicking, and sharp dialog begged for some extra depth and thicker resonance. Interestingly, we liked the 1400 best when we turned its talents to well produced TV content. While the sound was always on the bright side for our ears, we were continuously surprised by the accuracy and precision projector’s driver compliment provided. A great example came from the BBC crime drama, Vera. The dialog was rich and supple, completely engaging us beyond the actual words, and simple effects such as footsteps on a gravel driveway, ruffles of paper and photographs, and even the crumple of a water bottle provided moments of rich definition. Over the next few days we enjoyed crystal clear dialog and a keen touch to lighter effects on selections as diverse as Rick Steves’ Europe to episodes of The Practice. 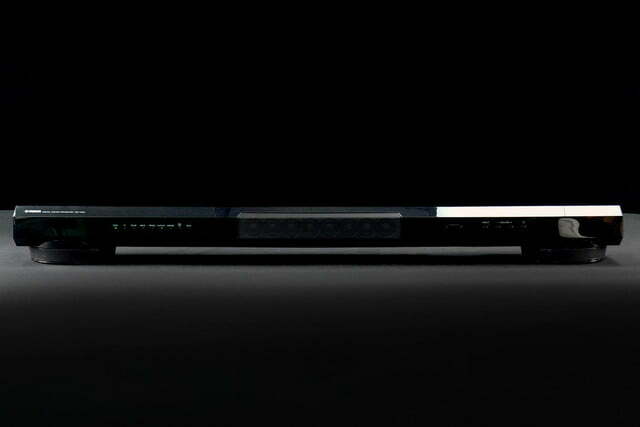 While we always appreciate the addition of Bluetooth, music playback was definitely not the YSP-1400’s strong point. The system’s stereo setting sounded bland and hollow in the midrange, while the surround sound templates added too much echo in a mess of digital processing. There was also a high dash of sibilance that was hard to overlook on a lot of tracks, especially notable on splashy cymbals and upper percussion. The YSP-1400’s smaller drivers simply aren’t up to the task of reproducing the kind of lush midrange we look for in music playback. Yamaha’s YSP-1400 Sound Projector delivers a bevy of features, an immersive soundstage, and great detail. The audio settings are fully configurable, and the system offers a lot of punch, without the need for a subwoofer sidecar. The treble was a little bright for our taste, and we were also disappointed with the system’s lack of HDMI ARC, especially since we couldn’t get it to read our TV remote’s volume commands. 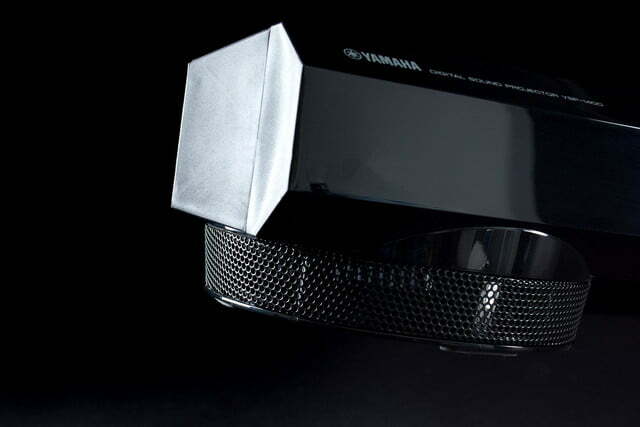 That said, we think Yamaha has really got something going with its sound projector design, and those looking for an engaging audio experience from a stand-alone solution will want to give the YSP-1400 a serious look.